Hope all is well with you. There’s alot of new things happening and figured it was a good time to send out an email to you. 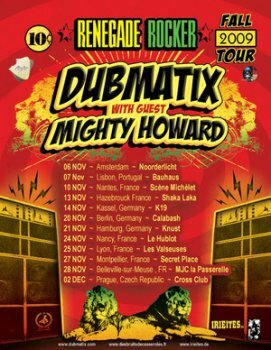 We’re gearing up for our 2nd European Tour in support of our Renegade Rocker release. Joining us this time is a very talented USA-born, Hamburg-based singer Mighty Howard. Tour starts Nov 5 in Holland and ends Dec 3rd in Prague. Check out all the dates below plus a couple of dates already booked for the UK in Feb. 2010. We’re issuing download codes for the track "Re-Action" Featuring Willi Williams from our Renegade Rocker CD. Use the DOWNLOAD CODE to grab the track – see end of this email.